Yaana - Events, Jain College, RR Nagar, Bangalore. Jain College, Rajarajeshwari Nagar is all set to bid farewell to its second PU students of 2012 - 2014 batch. 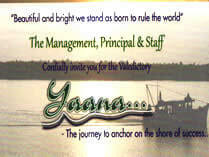 The College is organising valedictory function 'Yaana - The journey to anchor on the shore of success' on Saturday at 9 am.